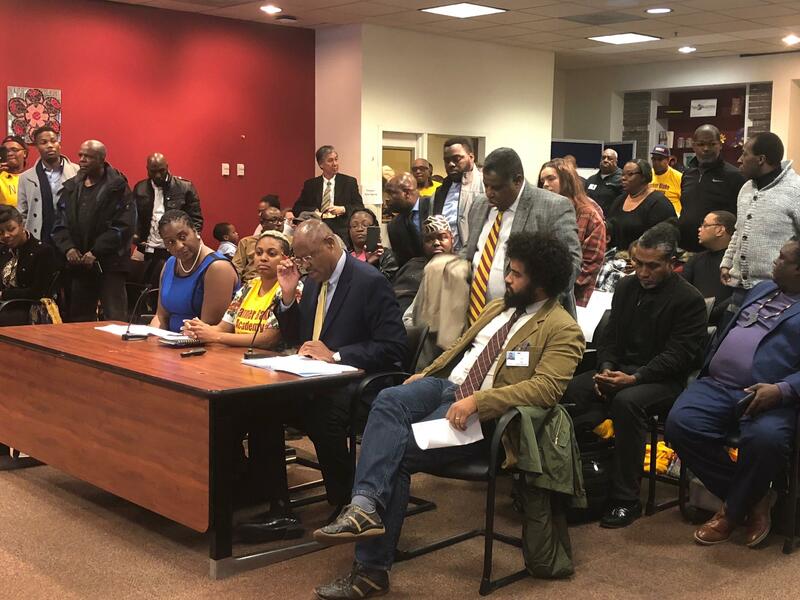 Banneker Blake Academy's faculty, staff, and parents pack a Tuesday night meeting of city schools board of commissioners. NATHAN: The main concern for the school board was special education, why? DOMINIQUE: Historically, city schools has been under a federally mandated consent decree that started because of lack of services provided to special needs students. A report prepared by school officials of the 2017 to 2018 school year said that the Banneker Blake’s 48 special education students were not receiving the services they needed. But last night Banneker Blake’s Individual Educational Plan or IEP Chair Tatiana Levone was at the meeting to share with the board the progress they had made on special education services, but also how previous years of mismanagement lead to some real issues. DOMINIQUE: FAPE is Free Appropriate Public Education which ensures educational rights for students with learning disabilities. So this school year all 48 special education students were called in because they were not receiving the services they required. NATHAN: There were two other glaring issues that the board looked at, correct? DOMINIQUE: Right so the first was that the school board felt it was an issue with the management of the school. The school’s founder, Carl Stokes, who you heard from Monday morning while he was protesting outside of the city school headquarters, was asked what was his hiring process for school administrators. Stokes admits that running a school is very different than running small businesses, something he has been doing for the past 35 years. DOMINIQUE: So Stokes admits that at one point they hired an administrator from California that was not qualified for the position. And the second issue has been the chronically low enrollment of students. Since the school opened in 2015 they have never met city school’s enrollment requirements. And again school board commissioners pointed to lack of effectiveness in school administrators. NATHAN: When the decision came down what was Stokes reaction? Much like his protest yesterday he continued to say that the report prepared by city school officials was inaccurate. NATHAN: And if the appeal does not go through, when would this school close? DOMINIQUE: The school would close at the end of the school year in June 2019. Tanya Bridges, who I spoke to on Monday, was there last night with her sixth-grade son Calvin Robinson and had this to say about the decision.